A proposal to build a series of luxury high-rises near the Brooklyn Botanic Garden is drawing opposition from tenant activists concerned over a history of mass evictions on the part of one of the developers involved. The proposed build-up is the latest in a series of contested projects that the city has pressed forward, including the large-scale rezonings of East Harlem and Inwood and, near the site of the current proposal, the Crown Heights Armory — all within the past year. 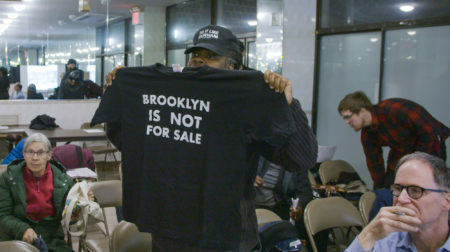 At a recent hearing held by Brooklyn Borough President Eric Adams, representatives for Cornell Realty Management and “CP VI Crown Heights LLC,” a limited liability corporation established by San Francisco-based Carmel Partners, made the case for a rezoning along Crown and Carroll Streets in Crown Heights. If granted the zoning increase, the developers would be allowed to build up to 518 units, and 175 feet, or 16 stories. It’s like telling a diabetic that you will give them some life-saving insulin, but they’re going to have to eat a gallon of ice cream to get it. Most of those who testified at the hearing, however, were opposed to the project, citing concerns that it will block out sunlight at the nearby Brooklyn Botanic Garden and that most of the units would not be affordable to neighborhood residents. Sarah Lazur of the Crown Heights Tenants Union (CHTU) questions Cornell’s ability to proceed in good faith considering the experiences CHTU members have had with the company. “Cornell Realty cannot be relied upon to make repairs that they are legally required to make or not harass tenants,” she said. Tenant advocates are also concerned about the involvement of Carmel, a luxury developer that deals in new construction and buys up distressed housing stock, which it then revamps at considerable profit. This summer Carmel quietly bought up the Crown Street portion of the development for $41 million and is the “managing agent” overseeing the Carroll Street portion as well. Celia Weaver of New York Communities for Change, a group that opposes the development, points to Carmel’s history of evictions. “This neighborhood doesn’t need any more luxury development — particularly luxury development from a private equity developer with a history of mass evictions,” she says. The evictions Weaver is referring to occurred mostly in California. In 2013, Carmel bought out the Marina View Towers apartment complex in Alameda and proceeded to issue eviction notices to 84 families, ostensibly to make structural repairs to the properties. Later that year, Carmel bought the Koinonia apartments, a 197-unit complex formerly owned by the Fuller Theological Seminary in Pasadena, California. The apartments had been used as affordable housing for seminary faculty, staff and students. The seminary sold the buildings without telling residents as part of a downsizing in response to decreased enrollment. After Carmel bought the complex, it issued eviction notices to all of the tenants, shut off electricity and changed the locks. Carmel displaced “about 400 people living there,” recalls Jill Shook, a Pasadena housing advocate who worked with many of the tenants, recalling that the company “did all they could” to ensure there would be no affordable housing at the complex. Shook and multiple West Coast tenant advocates The Indypendent contacted for this story pointed out that Carmel is a major contributor to legislative efforts against affordable housing in California. 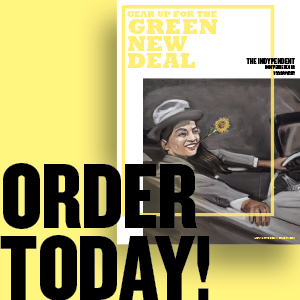 The company has donated nearly $400,000 to a campaign against Proposition 10, a referendum that would repeal the Costa Hawkins Act, allowing communities to expand rent control regulations. The company’s website classifies the Crown Street development as a “debt” investment — projects that are generally funded through real estate trusts, comprised of pension funds and other institutional investors. The company has raised over a billion dollars for the Crown Heights project and other developments around the country with millions from sources like the University of Michigan’s endowment, the Texas County and District Retirement System, and the San Francisco City and County Employees’ Retirement System. One of the most significant trends we have seen is the decline in [the] homeownership rate and the emergence of a renter nation. During the prior decade, housing preference favored homeownership, and the availability of mortgage credit pushed the homeownership rate up… The Great Recession significantly tightened the availability of mortgage credit, which has caused the homeownership rate to trend down… This trend has strengthened demand for multifamily. The rezoning request for the Crown Heights development is based on the developer meeting the city’s Mandatory Inclusionary Housing (MIH) standards, meaning that the greater the amount of “affordable housing” the developer accommodates, the higher it will be allowed to build. The type of affordable housing proposed in this project is another matter. “It appears that they are asking us, the public, for a really huge favor — rezoning in order to build on a massive scale — and [are] not offering us enough in return to make the favor worth it,” Lazur says. Only 55 apartments or about 10 percent of the 500-plus the developers plan to construct will be affordable to households earning at or around the area’s $43,000-a-year median income. Neither Carmel Partners nor Cornell Realty responded to multiple requests to comment for this story. The Department of City Planning (DCP) reviewed the companies’ rezoning request on Wednesday, Sept. 26. When it issues its recommendation, the project will go before the City Council. 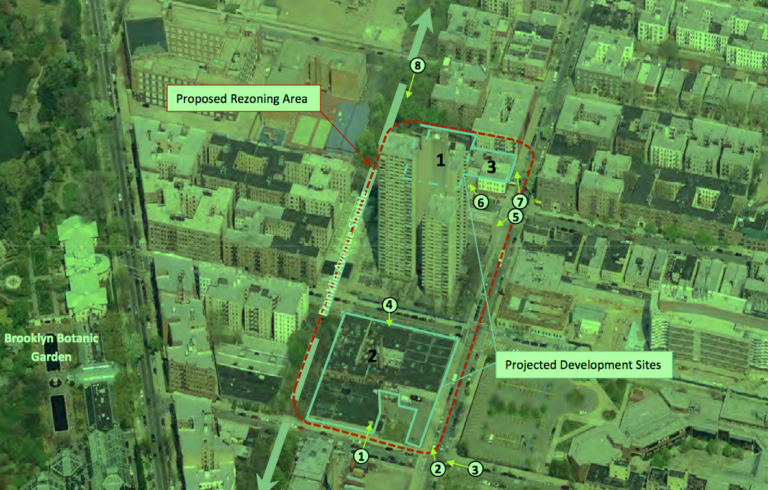 The Brooklyn Borough President’s Land Use office is set to release its decision any day now. What Adam’s office, the DCP and the City Council decide hinges on whether the developers are giving enough concessions to make the project politically feasible and the amount of opposition community groups can muster. Cornell submitted the project to the Crown Heights Community Board back in 2016. It was quietly withdrawn and resubmitted this past summer, at which point it was rejected by the Community Board, which issues recommendations but has no regulatory power. Arial view of proposed rezoning area in Crown Heights. Via the Department of City Planning, edited by Indy Staff.